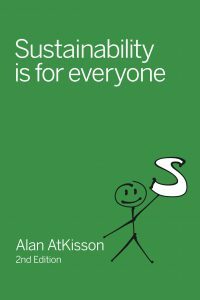 Alan AtKisson’s popular 50-page mini-book on communicating sustainability has just been released in its 2nd edition. And it’s free if you need it. In 2013, I wrote a little book in response to getting elected to the “Sustainability Hall of Fame.” That book — it felt more like a personal letter to my colleagues, illustrated with playful stick-figure drawings — ended up selling many thousands of copies, getting distributed to whole companies and large university groups, and being translated into several languages. In fact, many people began using my “personal letter to colleagues” as an introductory text on sustainability. No one was more surprised than I was. And over the years, the book kept on selling. So this summer, I updated it. Because I had to! In 2015, the UN Sustainable Development Goals (SDGs) arrived. Finally – officially! – sustainability truly is for everyone. At the United Nations, 193 governments came together to say exactly that. “Surely this little book has to say something about the SDGs!” I thought to myself. So here is the new, 2nd edition. Most of the book has not changed, including its key message: “Sustainability is for Everyone.” I want to keep pushing sustainability out beyond the professionals and specialists, and into the rest of the world. (So does the UN.) This little book helps do that. And there is also a new PDF version. You can download that version for free, if you need it. Otherwise, you can buy the paper, e-book, or PDF versions at the usual price of $5.95. Click here for more info — on all of the above. And in keeping with the whole theme of the book … I’m flexible on this. “Sustainability is for Everyone” is for everyone. I’m happy to work with you, whatever your economic situation, to ensure this book reaches everyone it really needs to reach. Ideas? Questions? Just write to me. And keep spreading the word: Sustainability is for Everyone. P.S. Don’t forget our other, still-pretty-new book: Parachuting Cats into Borneo, co-authored with Axel Klimek. Paper, e-book, and audio versions available!